Access to this product is valid for 180 days of usage. After this period, this product can be viewed under the "view expired" link in your CengageBrain account. MindTap Programming for Hoisington's Microsoft Visual Basic Windows, Web, Windows Store & Database Apps, 1st Edition, helps you succeed in class while also preparing you for your career. Research shows employers need troubleshooters and creative problem-solvers to stay relevant in today’s fast-paced technology-driven world. With MindTap you are taken through the basics before challenging you with more difficult activities. The learning path will guide you through text readings that can be read to you and real-life scenarios that sharpen your critical thinking skills. Throughout the course you will be supported with study tools that help you stay organized and efficient. Flashcards allow you to quiz yourself, and a study guide populates with your highlights and notes to make information easy to find when it’s time to work. With MindTap you always know where you stand --- what’s due and when, your grades, and how you compare to the highest performers in class. Learn more at http://www.cengage.com/mindtap/ Want to know where you stand? Use the Progress app to track your performance in relation to other students. Need to connect with other students? The Luvo (Flashnotes) App lets you buy and sell notes from lectures and coursework. Access to this product is valid for 180 days of usage. After this period, this product can be viewed under the ""view expired"" link in your Cengage account. Please check the ISBN that your instructor provided. If the ISBN-13 does not match this product (9781337627931) or its Printed Access Card equivalent (9781337627948) this may not be the correct product. In some cases, you may also require a course code from your Instructor. MindTap MIS for Coronel/Morris' Database Systems: Design, Implementation, & Management, 13th Edition, helps you learn on your terms. Track your scores and stay motivated toward your goals. Whether you have more work to do or are ahead of the curve, you'll know where you need to focus your efforts. And the MindTap Green Dot will charge your confidence along the way. No one knows what works for you better than you. Highlight key text, add notes, and create custom flashcards. When it's time to study, everything you've flagged or noted can be gathered into a guide you can organize. Please check the ISBN that your instructor provided. If the ISBN-13 does not match this product (9781337620079) or its Printed Access Card equivalent (9781337620086) this may not be the correct product. In some cases, you may also require a course code from your Instructor. MindTap Computing for Starks/Pratt/Last's Concepts of Database Management, 9th Edition, helps you learn on your terms. INSTANT ACCESS IN YOUR POCKET. Take advantage of the MindTap Mobile App to learn on your terms. Read or listen to textbooks and study with the aid of instructor notifications, flashcards, and practice quizzes. MINDTAP HELPS YOU CREATE YOUR OWN POTENTIAL. GEAR UP FOR ULTIMATE SUCCESS. Track your scores and stay motivated toward your goals. Whether you have more work to do or are ahead of the curve, you'll know where you need to focus your efforts. And the MindTap Green Dot will charge your confidence along the way. MINDTAP HELPS YOU OWN YOUR PROGRESS. MAKE YOUR TEXTBOOK YOURS. No one knows what works for you better than you. Highlight key text, add notes, and create custom flashcards. When it's time to study, everything you've flagged or noted can be gathered into a guide you can organize. New just no big box (manila) with manauls and disks sealed. We ship worldwide from San Francisco bay area. FROM BEGINNER TO ADVANCED: Whether you're a beginner at Access 2016 who wants to understand the software or an advanced learner who wants to update your knowledge, Simon Sez IT will help you achieve your goal. This professional training course will teach you everything you need to know, so that you can use MS Access with confidence. MASTER ALL OF THE MS ACCESS FEATURES: The Simon Sez IT training course will teach you how to use all of the MS Access tools and features. More specifically, by the end of this course you will be able to create and manage databases, design forms, generate reports, create macros, and so much more. All these sound difficult now, but the easy and hands-on software training course will help you master everything effortlessly! AN UNDOUBTEDLY SUCCESSFUL COURSE: Here at Simon Sez IT, we have been creating software training courses since 2008 and we have over 400,000 users in over 180 countries who have benefited from our comprehensive learning programs. If they can do it, so can you! Get the Access 2016 software training today and be sure that you will master it! 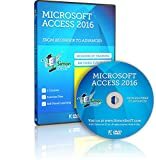 Master Access 2016 Alone At Home! Why pay a fortune on online or private courses when you can master Access 2016 from the comfort of your couch and at your own pace? Simon Sez IT presents you with one more professional training course, which will update your knowledge and teach you data management. Like all Simon Sez IT courses, this one is also self-paced, so it is up to you when you will follow it and how fast you will finish it. Are You New To Access 2016? This training course is ideal for beginners, as well as intermediate and advanced learners. The Simon Sez IT Training Course Is The Best Choice! Or at least that's what our 400,000 users from all over the world tell us. Our software training courses have helped many individuals, businesses and companies evolve and increase their productivity. So if you want to update and upgrade your knowledge in order to complete a personal project or help your business, get this training course as soon as possible! So what are you waiting for? Knowledge is one click away! Place An Order And Start The Access 2016 Training Course Today!